Home / Blog • Featured / Annies Final challenge: 78 miles, 4 cols, finishing up Alpe D Huez….not to mention the storm! Annies Final challenge: 78 miles, 4 cols, finishing up Alpe D Huez….not to mention the storm! For my final challenge I completed the long course ride of the Alpe d’Huez triathlon which is approx 78 miles of cycling including 4 mountain climbs totaling about 3000 meters of climbing. The first climb Le grande Sierre was lovely, lined with trees and a really nice temperature. It was approximately 12km of climbing, all on a relatively shallow gradient. The decent through the valley on the other side was amasing. The unexpected climb in between Le grande Sierre and Ornon: Malissol was a sneaky one (due to a road closure on the original course), and I did not know about it, but it wasn’t too bad. 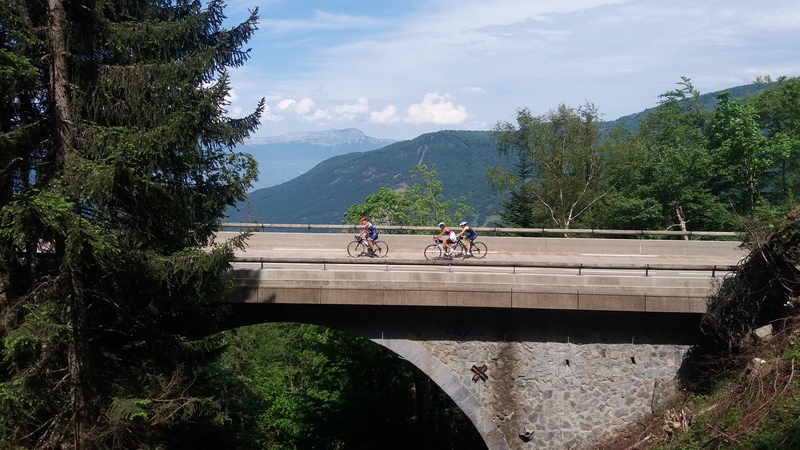 This was followed by another lovely descent along a viaduct which was a little scary but beautiful, however it was tiring and you, the Col D Ornon was the next climb which you are never really sure where it starts as it seems to go on for ages. Lastly I cycled Alpe d’Huez at the same time the Dutch were doing their challenge of Alpe d’Huzes which created a great atmosphere up until about turn 12 of the 21 count down turns. At this point the weather turned very bad, and it started to thunder and lightning and rain EXTREMELY hard. This created a very difficult terrain and there was rivers of mud and debris flowing down the road along with lighting bolts hitting the road. It was very cold and all my layers were in the car leaving me in a vest top in the cold. However I got to the top of the mountain even though the Dutch event had been stopped because of the awful weather. A massive thank you to Clodie and Sharon who got me through that whole ride and the last bit of Alpe d’Huez with their awful but great singing and persistence! Also a big thank you to everyone else on the camp- Fran, Ade, Simon, Dave, Derek and Jon- who also completed the ride and gave brilliant support. And another thank you to everyone who has, is and will donate. It has been an amazing experience and I wouldn’t have been able to do this without this massive amount of support that I have received so thank you to everyone that has been there along the way. Race, or not race, still unsure!